View/download a PDF map of campus. Take in the beauty of Drew's 186-acre campus—called The Forest—with our 360-degree tour. The University’s address is 36 Madison Avenue, Madison, New Jersey 07940. Use the stairs in the middle of the platform. Through the passage on your right, cross beneath the station. Go right on Kings Road for two and a half blocks where it joins Madison Avenue. Follow the sidewalk up Madison Avenue past Grace Episcopal Church and Madison Methodist Church (on left). The campus is on your left. There are three entrances to campus. Walk to the second entrance through the arched gateway. Directly ahead of you will be Mead Hall, a large brick building with white columns. To the right is a smaller brick house with a white wrap-around porch. This is Wesley House where the Office of College Admissions is located. There is no direct bus service from New York City to Madison. However, you can take a Lakeland Bus from the Port Authority Terminal (at 8th avenue and 42nd Street) to Summit, NJ, and then take a NJ Transit train (Dover line) to Madison which is about 15 minutes from Summit. Follow directions above from train station to campus. For more information, please contact the Port Authority Bus Station or call 212-564-8484. There is also a bus line that provides service nearby campus to Morristown or to the Livingston Mall for shopping. For overnight accommodations, we recommend the following hotels conveniently located near Drew’s campus. 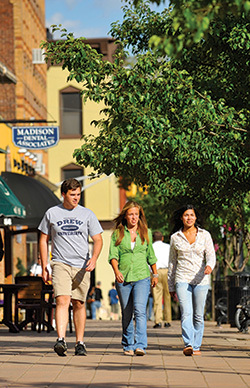 Just up the street from Drew’s beautiful, wooded campus is our hometown of Madison, where you’ll find Food Channel–famous cafés, cute shops and a music scene. Madison is ranked among the safest cities in America. Below are some favorite Madison eateries.